Seyoum Mesim (left), the autonomous Chief Negotiator, is driving the IGAD negotiations on South Sudan (to the extent that anyone is ‘driving’ them at all). August was not IGAD’s finest month. In Bentiu, a ceasefire monitor died of a heart attack after his captors forced him to march for miles; IGAD was unable to muster more than a strongly worded statement. In the same week, a shambolic heads of state summit adopted an “˜inclusive’ protocol that doesn’t include most of the parties to the talks; changed, at the last minute, the text of the protocol, virtually ensuring the SPLM/A (In Opposition) wouldn’t sign; and endorsed a cessation of hostilities implementation matrix that the SPLM/A (IO) claims it never saw, amidst such confusion that even attendees at the summit weren’t sure of what happened. It gets worse. On August 26, the day after the re-dedication of the cessation of hostilities and the “˜signing’ of the matrix, an UNMISS helicopter was apparently shot down. And then, just days later, the peace talks were adjourned, once more. Just what is going on in Addis? Since the IGAD mediation began, there has been criticism of the region’s lack of impartiality. How can interested parties, especially Uganda, the argument went, be honest brokers in South Sudan? This criticism, however, overlooked one crucial point: the difference between IGAD member states and the IGAD mediation, run by the largely autonomous chief mediator, Seyoum Mesfin of Ethiopia. Certainly, Ugandan interests and military intervention caused and continue to cause any number of complications. But Ugandan influence on the mediation itself is minimal: there are hardly any Ugandans in the mediation’s secretariat, and none at senior level. Chief mediator Mesfin does not take his orders from Kampala. Addis drives the mediation, to the extent anyone is driving it at all. Summits, however, are different. Heads of state can do what they like, ignore the guidance of their appointed mediators and change the draft documents that appear in front of them. While no one, save the South Sudan government, is standing up for the document today, there was broad agreement amongst all parties on 25 of the 28 articles in the Protocol on Agreed Principles on Transitional Arrangements Towards Resolution of the Crisis in South Sudan. While the original draft was not perfect, in its original form the SPLM/A (IO), the former detainees and the political parties, as well as the government, would likely have signed the document. Two of the three disputed articles (Articles 2 and 3) were changed at the summit, after the draft text had been introduced. The most significant change is in Article 2. The original text provided for South Sudan’s president to serve as head of state and for the prime minister to serve as head of government, with the powers of each to be negotiated in the talks. The final text combined these roles: the president would be head of state and government. This change came as a direct result of the intervention of Uganda’s President, Yoweri Museveni, who argued that a transitional government could not change the constitutional order: if the president was head of state and government now, he should remain so in the transition period. From there, changing article 3 was a formality. The carefully crafted draft didn’t matter: a head of state had spoken. The IGAD heads of state summit had two original objectives. The first was to definitively end the circular argument over the Cessation of Hostilities (CoH) Agreement, dating to January 2014. The government argued that it could not continue political negotiations until the CoH was truly in force; the SPLM/A (IO) argued it would not sign the CoH implementation modalities until Ugandan forces withdrew. The result of these duelling, intractable positions was no progress on any front. After many months, language that was acceptable to both parties – see section 1.2(e) of the matrix – was developed, and on that basis brought to the summit for final signature. IGAD’s incompetence gave the SPLM/A (IO) an escape from this commitment. The operative paragraphs on the preambulatory pages of the CoH re-dedication clearly commit the signatories of the document to the terms of the CoH implementation matrix. 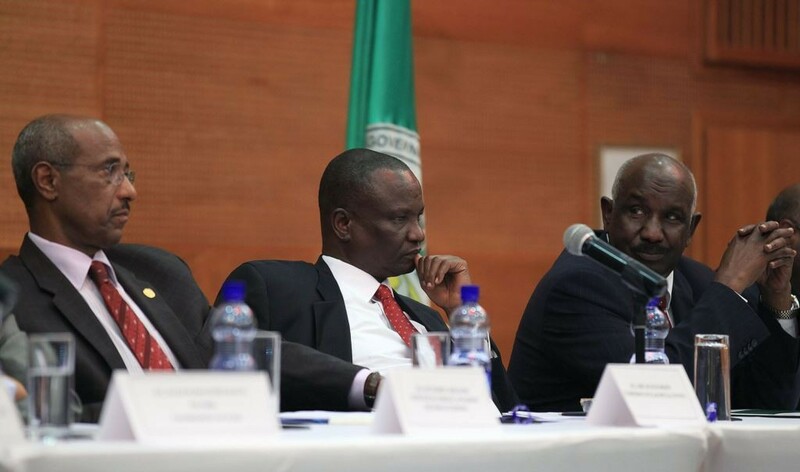 But in the confusion precipitated by shoddy organization and the looming departure of the heads of state, no one from IGAD obtained the copy of the matrix signed by both government and SPLM/A (IO), and nobody asked either party to sign or initial each page of the matrix, as the convention of protocol dictates. Later, the SPLM/A (IO) was able to claim that it had only signed the CoH re-dedication, not the matrix, and recommenced the same cycle of arguments about the withdrawal of the Ugandan forces. Requested to initial the pages of the matrix in the days following the summit, and the SPLM/A (IO) chief negotiator point blank refused. IGAD’s position is that the matrix was signed by virtue of the operative clauses of the preamble. But witness the signature page of the signed Protocol: it is silent about signatories and guarantors. By oversight, not design, the hastily edited document removed the signature lines for the other stakeholders. The event was such a mess that the protocol officers didn’t even remember to invite representatives of the former detainees, political parties, civil society and faith leaders into the summit room. Instead, they remained in the National Palace’s ballroom all day, while the summit stumbled on down the hall. Government mouthpiece Michael Makuei gloated: “˜I didn’t see you in the hall,’ he told the former detainees and political party leaders afterwards. Naturally, the other stakeholders felt they had been purposely left out, when poor management, not purposeful exclusion, was the cause. IGAD endorsed an inclusive agreement that forgot inclusivity, and signed an agreement in the name of stakeholders who weren’t even present. This argument forgets that the months of bilateral talks between the government and opposition prior to May 9 achieved almost nothing. It’s evident that the Protocol’s principles on accountability (article 15); institutional reform and oversight mechanisms in the security sector (articles 18-19); resource, economic and financial management (articles 20-22); transitional justice, reconciliation and healing (articles 23-24) were a direct result of the multi-stakeholder negotiations, and were unlikely to have been adopted if the government and opposition had been left to their own devices. In order words, inclusivity is the only way to salvage the ambition of this peace process. From the beginning, the risk has always been that an elite arrangement restores the status quo ante – involving other actors is the only way this can be avoided. The credibility of IGAD and the IGAD mediation is seriously damaged by the summit fiasco – but at the same time important, and unprecedented, ideas are now part of the framework of the peace process. In rebuilding the process, the focus must shift to these principles: while the furore today is on the mechanics of an elite, power sharing arrangement, real change was only ever going to come from the pursuit of other ideas – not in haggling over the predatory arrangements of the executive, which no matter its configuration is almost destined to disappoint whomever observes too closely. Future talks will only be useful if the negotiations focus on actions and reforms in the future transitional arrangements, and not only about who wields power. This post is contributed by a long-time observer of South Sudan who has closely followed the Addis talks. This is a serious read – hope the global community is taking note! Band-aid/quick fixes in long-standing complex culturally & ethnically-based matters on the Africa continent benefit no one, locally or globally!! It is unfair to accuse Jok Madut Jok – and other critics of IGAD’s approach – of forgetting ‘that the months of bilateral talks between the government and opposition prior to May 9 achieved almost nothing’. Perhaps the present author forgets that few bilateral talks could actually take place in those months, as IGAD’s inclusivity strategy even at that point was to insist that talks must be trilateral. Its demand at that time to involve the group of dissident but unarmed SPLM leaders was rejected by GRSS and so eventually had to be superseded by the schemes of internal SPLM dialogue and the multi-stakeholder track. Jok’s paper shows full awareness of the dangers in an elite office-sharing agreement, but also of a confusing artificiality in trying to incorporate demands which cannot practically be defended. The post-independence history of Sudan and South Sudan is full enough of dishonoured agreements (not to mention dishonoured laws and constitutions) to suggest that over-ambitious documents can be snares and delusions. We should not encourage ourselves to imagine that a large part of a long-term struggle for civic justice and peace can be won in the Addis hotels.